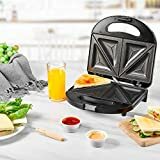 Quick Easy Meals: 750-Watts sandwich maker allows you to whip up delicious food at home, the park, and more in a breeze, reaching a temperature of 392℉ in just 3 minutes. Perfect for classic sandwiches or whatever is desired between slices of bread. Convenient & Portable: Features power on/preheat LED indicator lights. Includes a slim, space-saving design that allows for upright or horizontal storage in tight spaces. Max Safety: Built with a heat-resistant stainless steel case, heat-proof handle, automatic temperature control, and non-slip feet to keep it in place. 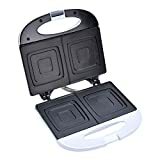 Super Cleaning Results: Nonstick coating grill plates ensure effortless food release, keep your food from getting stuck to the griddle and clean up a breeze. 100% Satisfied Warranty: We are confident our products are 100% food grade with FDA certified and 1 years quality warranty. 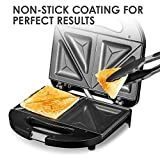 Enjoy your grilled sandwiches with easy cut diagonal indentations and endless possibilities.